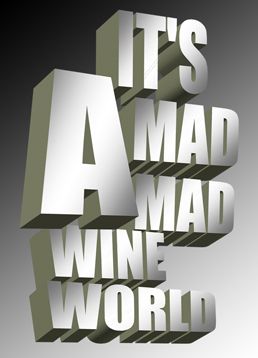 It’s a Mad, Mad, Wine World : In the 27 years that I have been in the wine industry, hardly any time goes past where somewhere in the world, there isn’t some weird and/or wonderful story occurring about the wine industry. Recently, I read two items which made me shake my head in wonder. Item 1: The first, being the fact that Russia is considering setting up a “state corporation” for winemaking in the newly nabbed, Crimea area. Russian Business Ombudsman, Boris Titov said: “We have proposed to establish a large corporation, which will be state-owned at the first stage, which would produce wine materials rather than operate on the wine brand market,…” He went on to say: “A state wine corporation could both produce wine materials and provide other services to the private sector. In particular, it could be used to create a pool of machinery and equipment for vineyard treatment and logistics centres to dispatch output to other regions”. This novel concept has come about since Russia annexed Crimea from Ukraine – Sorry, “liberated”, not stole. Nationalising part of the wine industry so as to “help the Crimean’s” seems to me to be like “the thin edge of the wedge”. What will that zany, merry fellow Putin do next – Nationalise other industries on some pretext or other until one day we will suddenly realise that the Soviet Union has been re-incarnated? Every one of the former states of the USSR has had grief of one sort or another from Russia, as soon as they have looked westwards, towards Europe for trade or friendship. They have had their gas cut off, or imports banned, travel restrictions, or as in the case of the Ukraine – part of their country stolen from them. 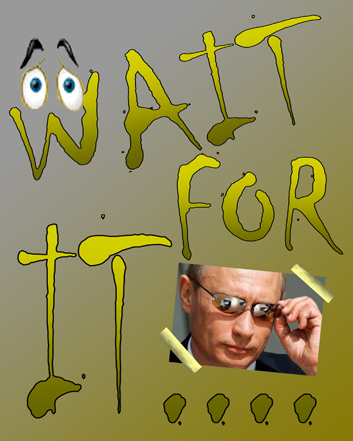 Russia or more precisely, Putin – has shown a reckless disregard for neighbour’s sovereignty and seems hell bent on flexing Russia’s muscles in the area. Can you imagine what the Sevastopol based state run wine industry will look like? How organised and efficient? I have flashbacks to the Soviet-era winemaking in Bulgaria et al where they made wines that were – just drinkable – just, just. Item 2: On the other side of the coin, have a guess where the world’s biggest wine cellar is and how big it is? I was totally wrong before I read the article that Adrian Smith wrote on Britwit’s Blog. Where did you guess? France – Maybe say Champagne, or perhaps one of the new Chinese Billionaire’s winery? – Or how about in California, USA? 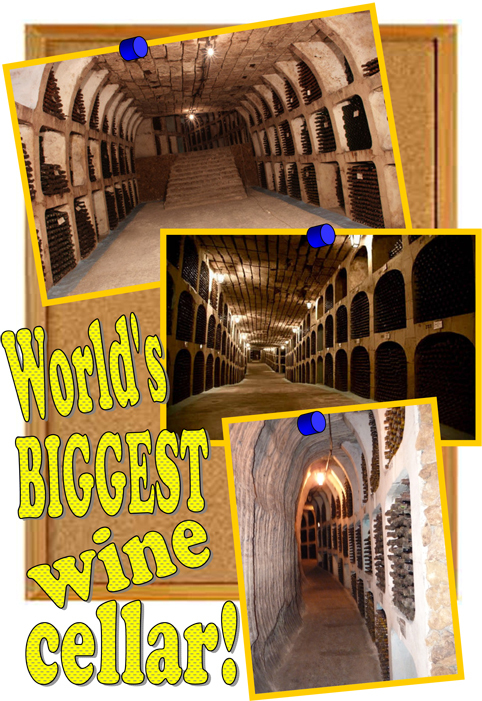 Well according to the Guinness Book of Records, the biggest wine cellar in the world is in – wait for it………..Moldova. Yes Moldova, a small landlocked country sandwiched between Ukraine and Romania with a population of some 3.6 million people (around about 80 percent of the population of Sydney). The cellar – wait for it………is 190 kilometres long and 80 metres under the ground. Only 54 kilometres of the facility is in use, and that part houses around 2,000,000 bottles of wine. “The State Enterprise Quality Wines Industrial Complex” (SEQWIC), was established in 1969 by the communist government to “produce, store and age” a variety of wines. These wines are made from a wide range of grape varieties which according to their records include – Pinot ~ Traminer ~ Muscat ~ Riesling ~ Feteasca ~ Dnestrovscoie ~ Milestscoie ~ Cordru ~ Neg ru de Purcari ~ Trandafirul Moldovei ~ Auriu ~ Cahor-Ciumai. The first five of these varieties I have tried, but the rest don’t even make an appearance in Jancis Robinson et al comprehensive tome, “Wine Grapes” – so Lord (and the Moldovans) has a clue as to what they really are. Wines from this Aladdin’s cave are exported from time to time, to Poland, Czech Republic, Finland, Denmark, Sweden, UK, USA and especially to Japan. Their records show that the most expensive wine was a 1973 or 1974 vintage sold to Japan for around the equivalent of US$600 a bottle.Wow! Imagine the thrill of the anticipation of opening a Cold War era communist red wine that you had paid US$600 a bottle for!!!! One would have to be totally certifiable!! So the wines sit there in a constant 12-14 degrees celsius, with 80-90 percent humidity for many years, even decades, only disturbed by the hushed mumblings of the tourists taking a walk through the first kilometre or so of the cellar. Then the tourist goes back upstairs and can do rather expensive wine and food tastings, where for US$75 you get to taste three to four middle-aged wines along with a cheese platter and Moldovan pies and sausages. Or if you are really decadent capitalists, for around US$400 you can taste seven wines including some of the very early ones and have a full slap-up meal. Then you can go to the counter and buy these unique wines. Boy, oh boy, don’t these ex-communists really know how to throw a shindig? Amazingly – This establishment has knocked back some quite lucrative offers from European winemakers to store their wines in these pristine conditions. I wonder how long it will be before some enterprising person builds a similar cellar in China? The internationally transmitted online radio show Lifestyles and Real Estate of the South Pacific is aired weekly. 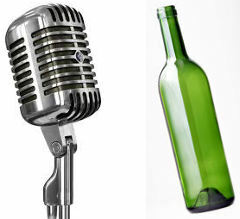 Two weeks in a row Dan Traucki came on the show and gave listeners an insight into the behind-the-scenes inner workings of the wine industry. You will enjoy listening to the interviews. Click "play" above. Both interviews total about 40 minutes. Click Here to browse our site while you are listening.